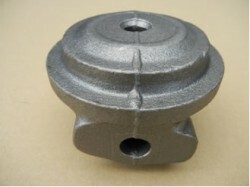 The lost-foam casting process Is an evaporative pattern casting process, in which a refractory material is coated on a foam pattern that has been formed to the required shape, and this coated pattern is used as the casting mold. 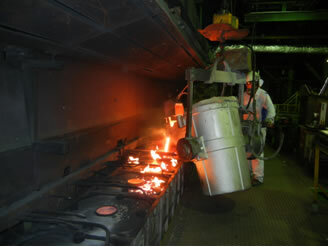 This mold is buried in dry sand, and the melt of molten metal is poured directly into the mold. The heat (1400°C) of the metal melt instantly vaporizes the foam mold, and the melt immediately replaces this “lost-foam,” producing the casting product. 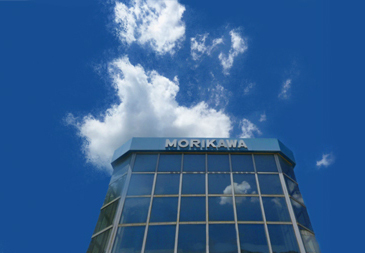 Although this method is used primarily in the manufacture of automotive parts, Morikawa has adopted the same method for a wide range of fields, including artistic castings and others. 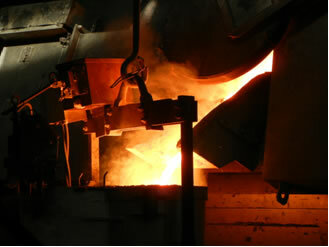 1 Melting: The melt shop utilizes alternate tapping of two high-frequency electric furnaces, using strictly-selected pig iron and steel scrap as starting materials. Thoroughgoing composition management is performed by spectrometry analysis. 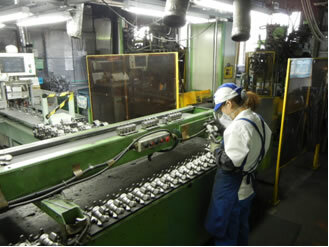 2 Pattern-molding: The lost foam manufacturing process, in which foam is replaced with molten cast iron, is rare even in Japan. First, a foam pattern is molded. 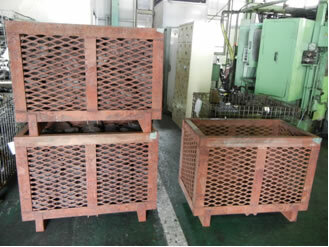 After drying, this mold and the gating system are assembled and coating is performed. 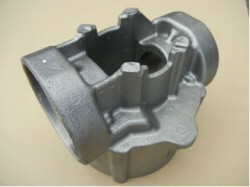 3 Sand fill and compaction: The foam pattern is placed in a metal box, which is called a “flask” in the casting industry. The flask is filled with sand and vibrated to ensure complete filling and tight compaction. 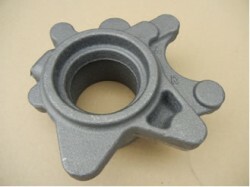 4 Casting: All casting is performed by hand under strict temperature control. 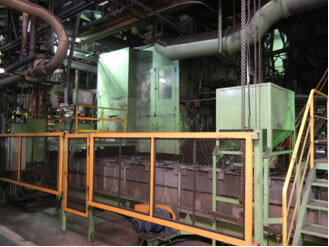 Unlike the green sand process, this process requires pouring at a quick timing. 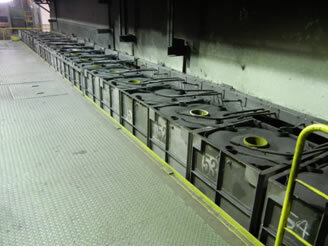 5 Shakeout: After passing through the cooling zone, automatic shakeout is performed by a dedicated hydraulic machine in order to separate the dry sand, gating system, and product. 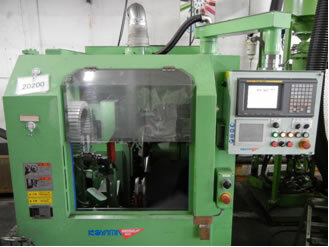 6 Shot-blast: Sand adhering to the surface is removed by shot-blasting with steel balls in a batch type shot-blast machine. 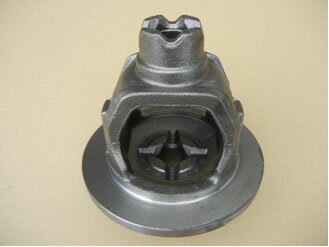 7 Finishing: Because a core is not used in the product part, the product is basically free of burr. 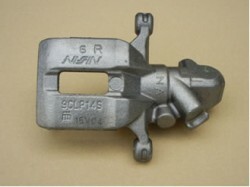 Only the gate and gate riser parts are removed using a grinder or press machine. 8 Inspection of external appearance: Visual inspection of all products is performed based on the inspection manual and limit standard manual. Products with complicated shapes are inspected using a fiberscope. 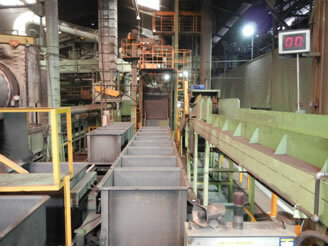 9 Heat treatment: Self-annealing (SA) is the basic heat treatment process. 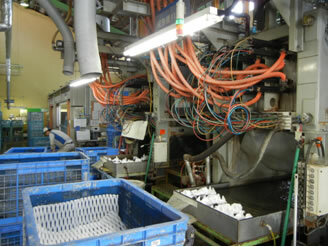 Depending on the product, strain relief heat treatment may also be performed by a cooperating maker. 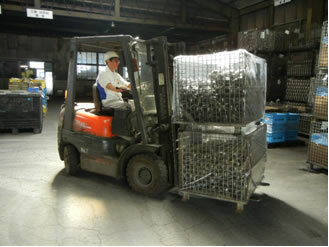 10 Shipping: All products are packed considering corrosion prevention, dust prevention, and cushioning. Products are then shipped by dedicated carriers serving each area, and are delivered to the customer on the designated date.